Background – I was born in the Netherlands with Irish nationality. My dad is originally from Athy, so I used to come here for my holidays with my parents and sister. I met my wife to be, Donna, on one of those holidays and have been living in Athy for the last 14 years. We now have 3 daughters, Shauna, Roisín and Niamh. I have been running on and off for 8 years. I had seen and heard of the TriAthy event and had said I would love to do that one day. but always had an excuse not to do it (no money, no confidence, no fitness, overweight etc. etc. ). One day I bit the bullet and went for it. I joined Athy Triathlon Club and did the Triathy sprint triathlon. I never looked back after that and was hooked on it. As a pleasant side effect, this sport has given me not only physical health, but also a much more balanced mental health and overall energy. I did not know there were different distances in this sport of which the Full Ironman is the ultimate one. Now 3 years later, I’m here, going the distance with a fantastic bunch of new buddies, I’ve found through our club. Never thinking this would be possible. So to mark this special occasion, it will be great to raise as much funds as possible for our chosen charities. Tri Experience To Date – 2016: 2 Sprint distances, 1 Olympic distance. 2017: 1 Double Olympic distance and 1 Half Ironman distance. Barcelona Goal – Finish it within the cut off time! If I can do it between 12 and 13 hours, I’d be really happy. And raise as much funds, for our chosen charities, as possible! Background – Born and raised in Athy, I moved away in 1997 only to return in 2007. On my return, I joined the hockey club for a few years before taking a hiatus to have my three beautiful boys. When the youngest was about one and a half, I decided it was time to try and get back out there and get active again. That’s when I found a ‘6 week to tri’ plan that led me to complete the Try-a-Tri at TriAthy in 2013. 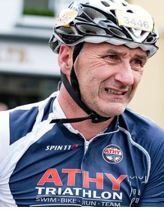 After crossing the finish line, I was hooked, joined Athy Triathlon Club immediately and have never looked back. I’ve made wonderful friends in the club who have encouraged myself and others to push the boundaries and realise that ‘anything is possible’. Barcelona Goal – My main goal is to complete the event within the cutoff (I’m pretty slow :P). This is the furthest I’ll have ever pushed my body. I want to prove to myself what seems impossible is actually possible. This is also going to be an amazing opportunity to raise much needed funds for the charities and causes we have chosen. Background – Originally from South Africa and living in Naas for the past 11 years, I am married and have two beautiful little girls. I did my first super sprint in 2012 because my brother said I was getting a little fat and I was carrying more rolls than a bakery, needless to say I was motivated. I absolutely loved it and have been participating ever since. I know I wont be on the podium any time soon but I love pushing myself to see what I can achieve. Tri Experience To Date – I have done 3 long distance races to date, Ironman South Africa, Ironman Vichy and Challenge Roth. Barcelona Goal – Sub 11 would be ideal but to be honest I really enjoy participating so happy with a medal around my neck, and a cold beer in hand. 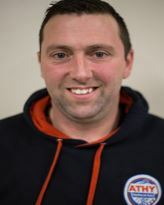 Background – Originally from Dublin, living in Athy 11 years. Married with two children. 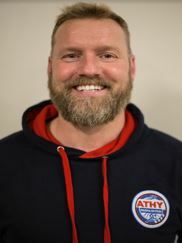 After doing absolutely no sport or exercise since my early teens, I joined Athy Triathlon club in 2013 (aged 39) with a goal to lose some weight, get a little fitter & “tri” something new. My triathlon goal was to complete one race (TriAthy Sprint) before retiring into midlife obscurity. Very quickly bitten by the Tri bug and have been chasing my own triathlon limits ever since. I have found Triathlons, especially the longer distance events, to be hugely beneficial to my physical and mental wellbeing. It’s a social sport with all walks of life getting involved. I take part to complete not compete (just as well say my pals) and try to have fun & make new friends along the way. Tri Experience To Date – From surviving my 1st Sprint Triathlon in 2013, I have slowly progressed through the different triathlon distances, completing a few half & 2 full distance events to date (Ironman Barca 2016, Hardman Killarney 2017). My best Tri experiences being those shared with fellow team mates, family and friends. Barcelona Goal – Survive, enjoy & maybe a sub 12hrs finish – In that order. I’m also really excited about being part of a team that can raise awareness and much needed funds for such worthy causes. Background – Married to Niamh with 3 kids. I played rugby and football in school and stopped all sports when I left school. I had a back operation in 2012 and after my recovery I began cycling a little. This in turn led to running a few years later and culminated in me competing in my first Triathlon in 2016 in Athy. Tri Experience To Date – I did 2 Sprints in 2016, TriAthy and Dublin City Triathlon. 1 Olympic distance Triathlon in Athy and 1 Sprint in Carlow in 2017 and also Ironman 70.3 in Dublin. Background – Photographer & Videographer. Always looking for a challenge and to get out of my comfort zone. Tri Experience To Date – I’ve only done three Triathlons so far, so not really sure what I’ve got myself into. My second triathlon was Dublin Ironman 70.3 and instantly said I’ve got to do a Full Ironman. I love setting my eye on what seems like an impossible target. Barcelona Goal – To complete it would be super, and comebck with a new challenge in my head for next year. Background – A native of Athy. I always enjoyed sports growing up. The excitement, energy and sheer enthusiasm of those I’ve met always keep me going. I caught the Tri bug in 2011 when I did my first Triathy. I always pushed past my fears and comfort zone so I slowly progressed from sprints, Olympics, half Ironmans to finally Ironman events. I never really was speedy so the slow steady race suits me better. 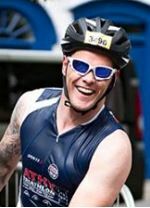 Tri Experience To Date – From my first TriAthy experience in 2011 I’ve built up my endurance over the years. In 2013 I represented Ireland in my age group at the World Triathlon Championships in London. That was an unforgettable experience. I’ve completed 2 Ironmans: 2016 Challenge Galway (to celebrate my 40th) and 2017 Ironman Lanzarote, to challenge my dislike of hills. I’m delighted and proud to say I crossed the finishline of one of the hardest triathlons in the world. Barcelona Goal – My goal in 2018 is to better my own times and keep pushing past my comfort zone. To enjoy every minute of the experience and be grateful to be able to do it. 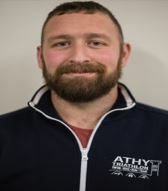 There is an awesome Athy Ironman team and I hope we can get to know each other and support each her along the journey as we raise money for a worthy cause. Barca 2018! Background – Living in the Athy area for the past 15 years, but originally from Waterford. Married with three children. 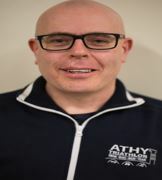 I joined Athy Triathlon Club in 2017 so as to have an end goal to improve fitness and enjoy training with the club. Fully smitten by the Triathlon buzz, I look forward to taking part in longer events. Barcelona Goal – All going to plan, I aim to finish under 13 hours but also to enjoy the journey with my team mates along the way. Background – Living now in Kilmead, Co Kildare for about 20 years, originally from Ballinteer in Dublin. Married to Ann with 4 lads, Daniel, Stuart, Graham and Thomas. Started running about 10 years ago to try lose weight after giving up cigarettes. I ran a couple of 10k’s and heard about TriAthy. Joined Athy Triathlon Club and completed my first triathlon in 2013. Never expected to be training for my first Ironman and really could’nt consider it without the support of my family. Tri Experience To Date – Sprint and olympic triathlon distances so far. Barcelona Goal – To enjoy the event from the start and hopefully to finish and celebrate with the rest of the club. Really delighted we are using this journey to raise awareness and money for some great charities. Background – Moved into Athy from Kilberry when I was 18. Married with 1 child. 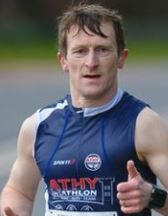 I played sports all my life, switching from GAA to running with St. Albans and into Triathlon. Back in triathlon this year after a 2 year absence. Tri Experience To Date – Numerous sprint and olympic distance races completed. Finished Ironman Dublin 70.3 in 2015. Barcelona Goal – I have a time goal which I will keep private for the time being. My other goal this year is to regain some fitness and get training consistently after injury. Really excited about being part of a team & very keen to raise awareness and funds for our chosen charities. Background – I’ve lived in Athy all my life. Married to Karen with two children, Shane and Chloe. Karen is a PE teacher and her positive attitude to fitness eventually rubbed off on me after a few years of marriage. 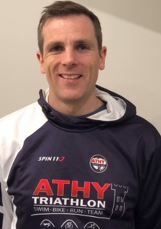 I joined Athy Triathlon Club in 2011, at which time I was barely able to swim and had a low level of fitness in general, but I was determined to improve on both. Since then I have made some great new friends and completed races that I thought I would never be able to do. 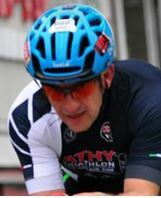 Tri Experience To Date – My First triathlon was Try Athy, a short one but a great achievement for me at the time. Since then I’ve tried to complete longer races as a personal goal. To date the longest event I have completed are two half ironman races in Dublin and a double olympic in Athy. Barcelona Goal – Ironman Barcelona wil be a huge mental and physical challenge for me but I’m looking forward to the journey. A real bonus will be to use the experience to raise funds for some well deserving charities. I also fee very privileged to be part of a fantastic group of people on the same journey. Background – I live in Carlow, my hometown and work as Managing Director of Bosco’s Meat Outlet Ltd. I am married with one child. 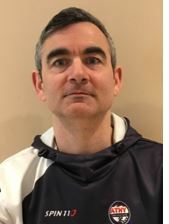 I have been involved in St. Laurence O’Toole’s club for the past 3 years, currently serving as Chairman and an active member of Athy Triathlon Club also. Tri Experience To Date – I have moved my way through Sprint Triathlon’s to half Iron distance. With plans to do Ironman Barcelona 70.3 in May and Ironman Barcelona in October this year. I currently train twice a day, four days a week. Barcelona Goal – I am mostly looking forward to being part of a team participating in this event and also raising funds for such worthy causes. Background – From Carlow, living in Killeen Co. Laois and compete for a Kildare Triathlon Club. Married to Karen with two daughters, Emily 6 and SarahKate almost 5. I come from an endurance/long distance sport background. 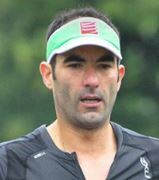 I retired from competitive race walking in 2015 after 21 years of various National and International levels. I competed in World Junior Championships finishing 6th best European. I also competed in European and World race walking cups, 5 Nations Championships and winning the team and individual competition’s for 3 years. Unfortunately a couple of illness and thyroid problems put paid to my Olympic dreams. 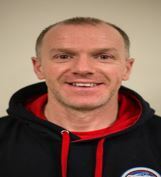 I am a level 2 athletics coach and a level 2 European Athletics (EAA) race walking judge. 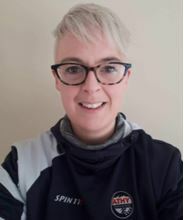 Tri Experience To Date – Having been fascinated with and always wanting to to do a Triathlon I joined Athy Triathlon Club in 2016. I learned to swim for my first Triathlon, the Tri event in Athy. I went on to do 5 more sprint races that year. I was hooked and did olympic and half ironman distance events in 2017. Barcelona Goal – 2018 will be a big personal joruney and challenge. I aim to complete my 2nd half ironman in Barcelona in May and also complete the National Series in Ireland while training for the Full Ironman in Barcelona in october with my other 21 club mates. The Ironman motto of Anything is possible really rings true with a club like Athy, it’s a club full of people from all walks of life and each one with their own story and journey, who have embraced the club and each other like one big family and who really can make anything happen. Background – Grew up in Kilberry, Athy. I’ve worked in Tegral Buildings for the past 15 years. Married to Maggie and father to two beautiful girls, Caitlin (8) and Caoimhe (5). Growing up I was very involved in the Rhebhan GAA club and proud to be part of a team who won The Junior A in ’96 and Teh Intermediate in ’97. I am also proud to have won an All Ireland medal with Tegral Factory League in 2003. 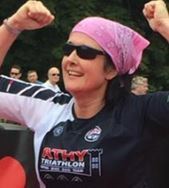 Tri Experience To Date – I completed my first Triathlon in 2009 and will never forget my swim, I must have stopped 10 times. 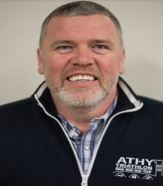 Maggie and I became members of Athy Triathlon Club in 2015 and are delighted to be part of the friendliest and most supportive club in Ireland. We have completed several triathlons, Duathlons and running events around the country. My greatest strength is running. Some of my achievements include coming 3rd in the Waterford Medieval 3/4 marathon in 2016, completing the 50km Ultra in Donadea and completing a sub 3 hour finish in Dublin City Marathon in 2017. Barcelona Goal – I’ve always wanted to do an Ironman. Inspired by my fellow club mates I registered for Ironman Barcelona. I am very excited and look forward to experiencing the whole Ironman Journey from training, to getting to the startline and crossing that finishing line (I hope!!). What makes this journey even more special is we have the biggest representation of any club participating in the event and will be using it to raise funds for local charities. Background – Originally from Dublin, but have been living in Dunlavin for about 14 years. I’m married to John and we have four children . I joined the Club in 2014 having spent a year in triathlon going it alone!! It was the best decision I ever made as I have made so many friends and have found myself on the most amazing journey that I would never have thought possible!! 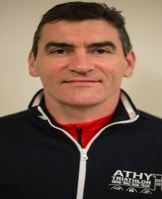 Before taking on triathlons I had completed a number of marathons and had spent 13 years in the Reseve Defence Forces serving as a Lieutenant, which I believe gave me the stamina and endurance needed for the sport. I would have had a bit of competitive streak in me back then, but now do races for pleasure and not for times. Tri Experience To Date – My first triathlon, like many, was TriAthy Sprint in 2013. To my relief, I didn’t come last but felt that I needed to go back and do another to prove to myself that I actually DID enjoy it! I did another 2 in 2013 and felt I could finally call myself a triathlete! After that I found myself wanting to do more and go longer! I started working my way through the distances, numerous Olympics, 2 x IM 70.3’s ….. IM 140.6 in 2018???? Barcelona Goal – To get around the course in one piece and to make my family proud!! So proud to be part of this wonderful team who will no doubt reach the fundraising goals we set out to achieve!! Background – Im from Kilberry & currently live in Athy. Married to Karen and we have 2 young boys. I’ve a positive attitude towards fitness and enjoy it very much. I played GAA football from the age of 7 years old and continued to play until the age of 32. Throughout the latter years while playing football I also became very interested in triathlons. Tri Experience To Date – My first triathlon ws TriAthy in June 2007 as a team event which was a great achievement for me at the time. 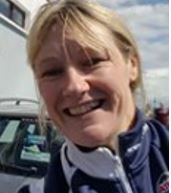 Every year since, I have completed a sprint, olympic and double olympic triathlons in different counties throughout Ireland. My biggest achievement to date is finishing the Half Ironman in Galway September 2011, which I am very proud of. Barcelona Goal – Ironman Barcelona has always been a huge ambition of mine. I am looking forward to this journey with a great group of people. 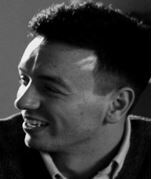 Background – A native of Lonford, living in Carlow. Cross country running was my first introduction to sport, joining Longford Athletic Club at the age of 10. Cross country running is definitely character building!! Have played most sports; basketball, Gaelic, Tennis and Squash to name a few. Did my first Triathlon in 1995 but it took me nearly 20 years to do another one. In 2014 I did the TriAthy Sprint and was hooked. Joined ATC and never looked back. Tri Experience To Date – Have completed sprint, Olympic and Half Iron distance. Completed Ironman Dublin 70.3 in 2015, TriAthlone Half 2015 and Challenge Galway half 2016. Barcelona Goal – To enjoy the experience and get over the line before the cut off time. Background – I’ve always been sporty, and took up triathlon after I finished playing hurling in 2009. 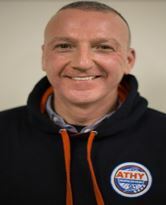 I joined Athy Triathlon Club in 2013, definitely one of the best decisions of my life, as it has a brilliant group of people to train, race and socialse with. Tri Experience To Date – To date I have tried all the various triathlon distances. Barcelona this year will be my 3rd Ironman. Barcelona Goal – Beat my previous time. Background – I’m from Ballylinan and went to secondary school in Athy. Having lived away for many years I’m back living in Ballylinan now and am married to Ethna with 2 teenage kids. After returning home a number of years ago I was in town to see the TriAthy event in 2010 and thought to myself “that looks great…..if only I could swim”. So I took to the pool in K-Leisure and later that year completed my first Sprint triathlon (The Quarryman in Meath). 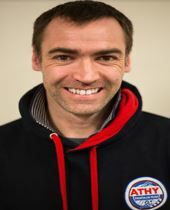 I trained and raced solo for a couple of years and then joined ATC, who are a fantastic bunch of people, making the Triathlon experience even better. Tri Experience To Date – I’ve participated in all distances (sprint, Olympic, IM 70.3 and Full Ironman) and usually try do 6-10 races/events per year. I was part of a large Irish contingent tht took part in the World Championships in London in 2013 (Sprint race) and have completed one Full Ironman distance to date (Challenge Galway 2016). Barcelona Goal – Train well for the race, avoid injury and give it my best shot on the day….. In the great company of the ATC gang. Hoping it won’t be too hot on the day as I don’t’ cope well with the heat. Background – Having been dragged around the wicklow mountains since I was 6 I was always going to end up in endurance sports, running, biking, hiking etc. Having taken a rest to get married and adjust to living in Co. Laois I jumped back in having discovered the growing Tri Club in Athy. Since then I’ve been inspired by the achievements of so many at the club, as well as the amazing atmosphere and camaraderie that accompanies every training session and event. 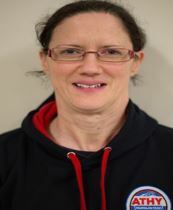 Tri Experience To Date – I did my first event, Olympic distance, in 2003 in order to force myself to learn to swim! While the jury is out of that’s worked or not I’ve found that the sport has constantly offered more challenges as you progress through it, and always against the hardest metric of all – your own expectation. Ironman has been on the bucket list since 2 friends of mine finished in 2005, and I thought they were crazy. Now I want part of the insanity. Having completed a raft of Sprind and Olympic distance races as well as longer adventure races, Ironman is now the big goal for me in 2018. Barcelona Goal – The hardest part is getting to the start – injuries are a high risk when undertaking a challenge like this. So that’s goal #1! Once I line up the only goal a newcomer can have is to see the finish line, anything else feels dangerous when facing down a race as arduous as Ironman. However, once I line up I know the 21 other ATC athletes and support will be the best weapon in taking this beast on. Background – I live in Tullow with my Partner Caroline and our almost 3 year old son Sean. I had an ACL knee operation in 2013 and wanted to set my sights on a challenge to motivate myself to get back fit. I set my sights on Try a Tri in Athy on the following June Bank Holiday weekend. I ended up doing the Sprint Tri, it was tough but I said to myself I’ll have more of that. I enjoy seeing so many people from so many walks of life taking part and of all ages. It encourages me when I see people older than me by 20 years plus taking part in the same events. Barcelona Goal – My 1st full distance Ironman awaits. Made so much better being part of a team and for great causes too. Bring it on!! Background – I’ve always loved being involved in and playing sport, and keeping fit in general. Working as a truck driver however had limited my time for it for several years. Add to that eathing all the wrong foods and it was not long before I became unfit and overweight. All this changed after being a spectator at TriAthy 2015. I could feel the buzz around the event and all the excitement on participants faces. The atmosphere was electric. I saw a group of Athy Triathlon Club mates all chatting, laughing and propably going through tactics. Long story short I made myself a promise to to the event the following year. My life changed from that moment. I improved my diet, started training and shortly after joined Athy Triathlon Club. They are an amazing group of people, all willing to share their stories and advice when asked. Everyone loves seeing everyone else improve. A really supportive club. 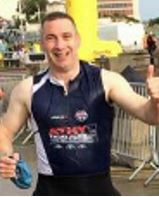 Tri Experience To Date – My 1st Sprint triathlon was in Carlow 795 in 2016 and immediately I was hooked. The Tri bug hit me hard. I did more Sprint and Olympic races and completed my 1st Half Ironman in Dublin in 2017. Barcelona Goal – Ironman Barcelona will be my challenge of a lifetime. I just want to finish within the cut off times. Am really delighted to be doing it for charity too with the support of such a great bunch of people.